The earliest indication of human activity in and around south Lake Minnetonka is evidenced by the burial mounds of ancient peoples located in the area. A hunting and camping ground for many years, Lake Minnetonka and its surrounding woods boasted sites considered by the Dakota Indians to be sacred, many of them figuring prominently in their legends. As pioneers moved west across the Mississippi in the mid-19th century the Dakota feared increased encroachment. Tribal leaders asked the national government in Washington to have the Lake Minnetonka area included in the lands reserved for them in the 1851 Treaties of Traverse des Sioux and Mendota. This request was denied, and so the Dakota became silent bystanders as their hunting grounds were opened to settlement. "I have selected a site for a village and farming country, that for healthfulness of climate, fertility of soil, beauty of scenery and nearness to markets cannot be surpassed by any other locality in the country, being within twelve or fifteen miles of two of the most important towns in the territory, and having a front on a lake navigable for steam and other boats over forty-one miles, its waters clear as crystal and abounding with fish. The land around the lake is also supplied with natural meadow, the country is gently rolling and interspersed with the most beautiful growth of timber that the eye could wish to look upon, consisting of sugar maple, black walnut, butternut, white and red oak and a variety of others; also with wild fruit, grapes and berries of almost every kind; the whole country, in fact, possessing almost everything that the heart of man could wish for." ​In 1853 Bertram, his recently formed “Excelsior Pioneer Association,” and builder Robert McGrath, began to construct homes and businesses in what is now the city of Excelsior. The origin of the city’s name is thought to come either from Longfellow’s popular 1841 poem “Excelsior,” or New York State’s motto “Excelsior” – meaning “Ever Upward.” In either case, the name suggested the optimistic, striving nature of the community the settlers from the East hoped to build. Water Street, Excelsior, c. 1864. 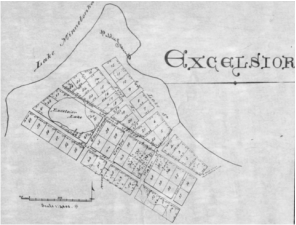 The township of Excelsior was organized in 1858 and originally included land in what is now Excelsior, Greenwood, Shorewood, Tonka Bay and parts of Deephaven and Orono. Early area pioneers included the families of Rev. 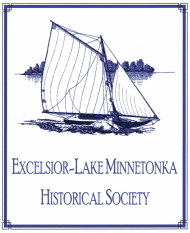 Charles Galpin (Excelsior), Robert McGrath (Excelsior), Lydia and William Ferguson (Deephaven and Greenwood), Peter Gideon (Shorewood and Tonka Bay) and William B. Morse (Big Island). Early plat of Excelsior showing "Public Grounds." ​be owned and enjoyed by the citizens of Excelsior in perpetuity. Now over 150 years old, this expanse of green running along the shore continues to be publicly owned and enjoyed by residents and thousands of visitors each year. 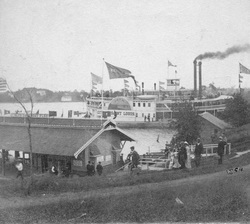 Excelsior incorporated in 1877, and soon became an international tourist mecca, complete with deluxe hotels and luxury excursion steamboats. Summer homes and cottages sprouted up along the shores of Lake Minnetonka, their owners often making the daily commute from Minneapolis by streetcar, swelling the population during the summer months. 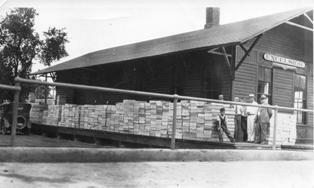 Excelsior Depot with berry boxes, 1929. ​Although tourism was the area’s largest industry, many residents were employed in agriculture, growing berries, apples and other fruits which were then shipped by rail to markets across the country. Lyman Lumber Company also employed many in Excelsior, beginning as a small lumber yard in 1897. Excelsior Amusement Park, c. 1940s. From 1925-1973 Excelsior was home to the popular Excelsior Amusement Park attracting hundreds of thousands to the area each summer. The park’s ballroom, "Danceland," hosted musical acts from Tommy Dorsey to Lawrence Welk, and in later years, the Beach Boys (1963) and the Rolling Stones (1964). The Old Log Theater in Greenwood opened in 1940 and continues today, having entertained more than six million people over the years. As the years passed, some areas began to break away from Excelsior Township – Orono became a township in 1889, and Deephaven incorporated in 1900, Tonka Bay in 1901, and Greenwood and Shorewood in 1956. Today, Excelsior’s historic business district serves the city’s 2,400 residents and thousands of others from surrounding communities. Shops, services, dining and entertainment on historic Water Street and the area’s many historic homes offer a glimpse of the community’s beginnings and continue to attract visitors today.